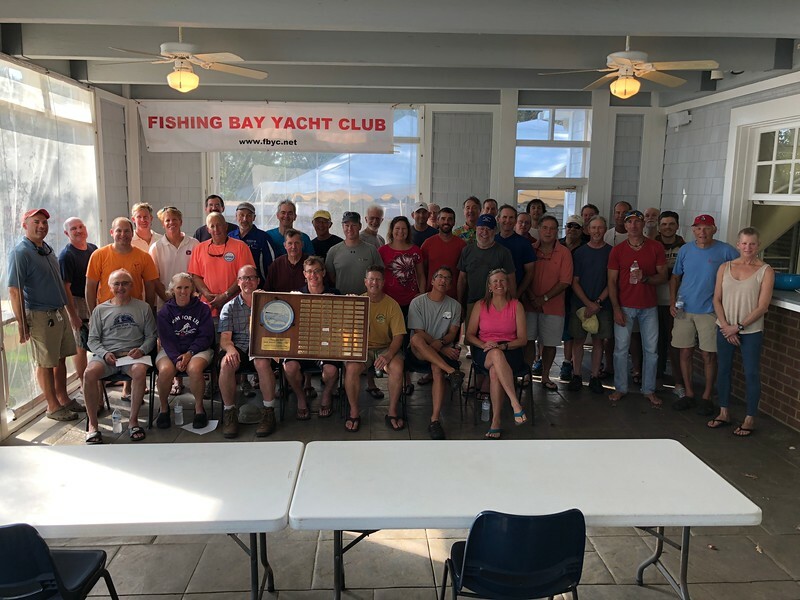 It was great weekend all around at the 36th Chesapeake Bay Laser Masters Championship where 44 sailors had 7 races over two days in a variety of conditions and Rob Hallawell from Milford Connecticut won the championship. 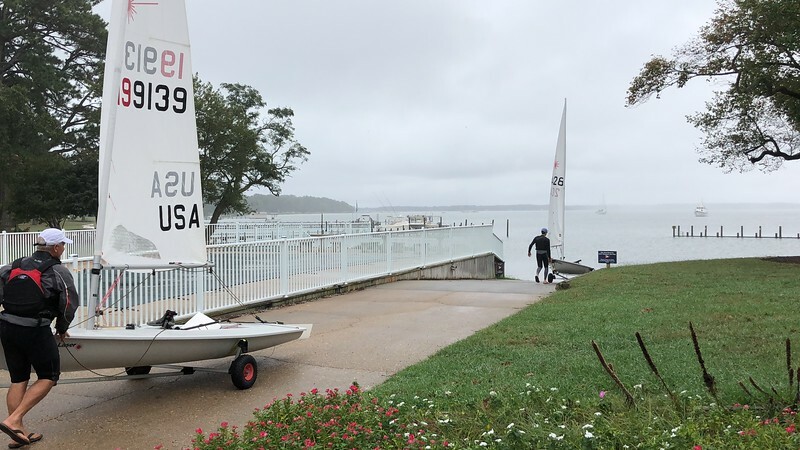 Sailors from as far away as Toronto and Miami began arriving at Fishing Bay Yacht Club in Deltaville Virginia mid afternoon Friday as the weather began to turn and cloud up with some misty rain. That didn’t deter some hearty sailors from going for a practice sail. High tides on Friday night and Saturday made driving down Fishing Bay Road more of an aquatic adventure and cars queued up at the hose stations for wash downs much like sailboats do after racing. It was reminiscent of Saturday morning 11 years ago during the District 11 Championship when the road was impassible in the midst of a storm. Unlike that regatta – everyone made it and racing was soon underway across the Piankatank River in Godfrey Bay into a NNW breeze at 6-8 with cloudy skies and a few spots of a misting rain. The high tides made for some significant current running 90 degrees to the course making the left favored most of the day. Susan Taylor (Severn SA) got off to a great start winning the first 1-lap race. Luke Shingledecker (Severn SA) won the 2nd race. Last year’s champion Gavin O’Hare (Eastport YC) won the 3rd race and Rob Hallawell (YYC) won the 4th. It would be Jacque Kerrest (Severn SA) with the best scores from the day to sit atop the leaderboard after Saturday’s racing. 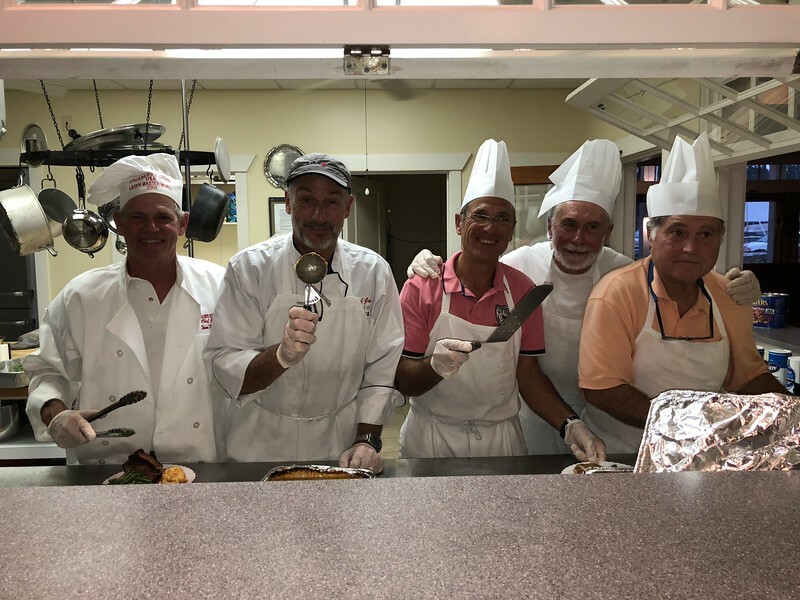 Saturday evening Alain Vincey and his crew of chefs including Claud Dumas, Frank Murphy, Don Hall, James Jacob and Kevin Lee served up another magnificent meal of Virginia surf & turf, Dixie Baby Back Ribs, Chesapeake Bay Crab Cakes, Mac and Cheese and Green Beans Almandine. It was all topped off with warm apple pie and vanilla ice cream for dessert. The cool conditions didn’t stop TWENTY competitors (almost ½ the fleet!) from hanging out after dinner and camping at the club Saturday night. Sunday morning brought better weather all around. The wind clocked around to the WSW at 10-12 and the clouds slowly burned off throughout the day. In a building breeze Rob Hallawell picked it right to win the first two races of the day. Luke Shingledecker and Mike Schmidt were close behind finishing 2nd and 3rd in both races respectively. In what would be the last race of the day the first start was general recalled followed by a U-flag start in a breeze that dipped from 15 down to around 8. This shuffled the deck quite a bit as sailors tried to change gears. Bob Tan (Severn SA) won the race Rob kept enough points ahead of Luke and Mike to win the overall. Len Guenther and Charlie Brewer were the top Fishing Bay sailors both finishing in the top 10. Jon Deutsch, Frank Murphy, Mike Toms and Ron Jenkins rounded out the rest of the home team contingent. A big thanks to our Laser Masters race management team – led by Rick Klein including Mike Dale, Alex Alvis, Brad Miller, Becky Dale, Cathy Clark, David Clark, Debbie Cycotte, Donda Alvis, Doug Stinchcum, John Beery, Jon Wake, Paul Almany, Ruthana Jenkins, Sharron Bauer and Tom O’Connell. And thanks to Natalie Burls for helping on the safety boat.